Great news! A lot of members won 5604 - 1st prize direct number on 16 Nov 2011. 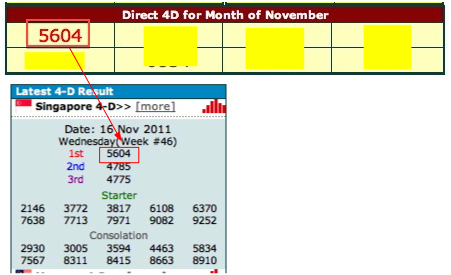 This number is forecasted in the "Direct 4D for the month of November". I always pick 8 direct numbers for the whole month. Within this 8 numbers, I will pick 1 direct to be highlighted as the most important set. This 5604 was the RED one! It is not easy to hit direct number, it is even harder to hit 1st prize, but I did it! This can only achieve with consistency and patient. If you are Gold Member, I urge you to login frequently to check my special forecast. If you have IPhone or Android smart phone, you can also see this in the forecast feature. If you do not check, you lost the opportunity such as this 1st prize. If you are not Gold membership yet, join now! Just call 92300837 to check how to upgrade to Gold membership.